I love make up. I truly do. I tend to stick to the same things nowadays, after spending many lunchtimes in Boots (other sellers are available) loading up on new this and new that. And I like to get all of the product for my pennies. I am on a fairly tight budget these days. Sigh. One of my major bug-bears is inaccessable packaging. If I am in the market for a new product (usually foundation, namely because I am a sucker) then I make sure I can get into the bottle. Because, once the pump has stopped pumping or shaking a plastic container vigorously to get one more splurge out has ceased to be of use, these items are thrown away. 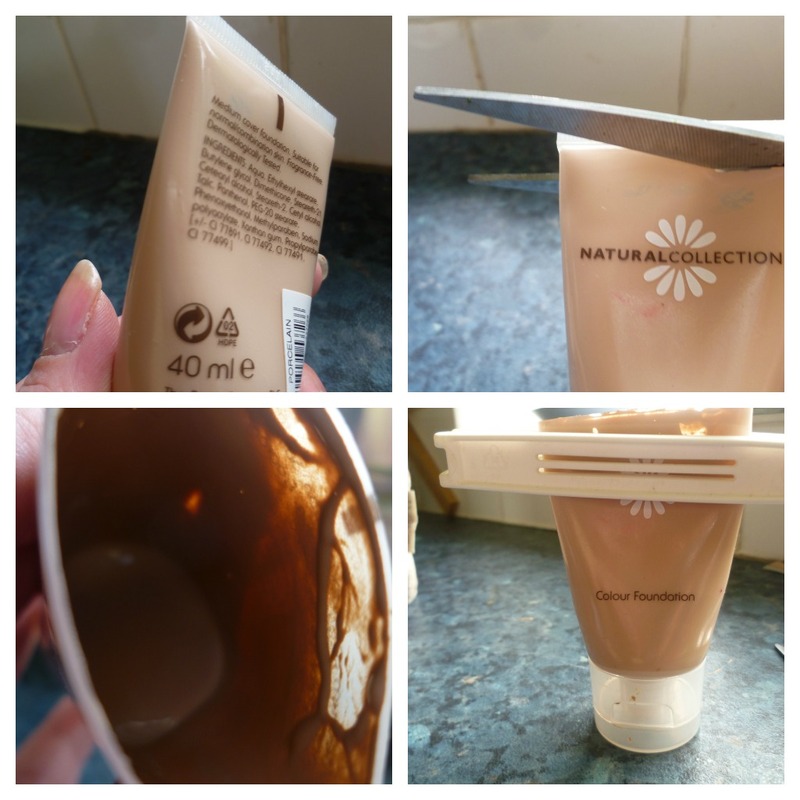 I have found there can be up to another weeks worth, usually more, of application in that there bottle or powder container headed for the bin. Next time you stop off for a hot beverage, be it on the high street or in your work canteen - see if there are any wooden stirrers lurking about. Grab a handful. I find all sorts of uses for these - getting crap out of the plughole to a plant stem splint. And a cat toy that gives The Moof endless minutes of "but I can tap it and it moves!" entertainment. A knife, scissors and away we go.. Foundations: As I have said, I check before purchase, that the pump top of most foundations has some room for removal. It might simply be twistable, or you might see when handling that there is a gap between the lid & the bottle. Either way, you should be able to tell by having a quick feel round the top. Simply place the knife between the base of the plastic lid and wiggle it in. 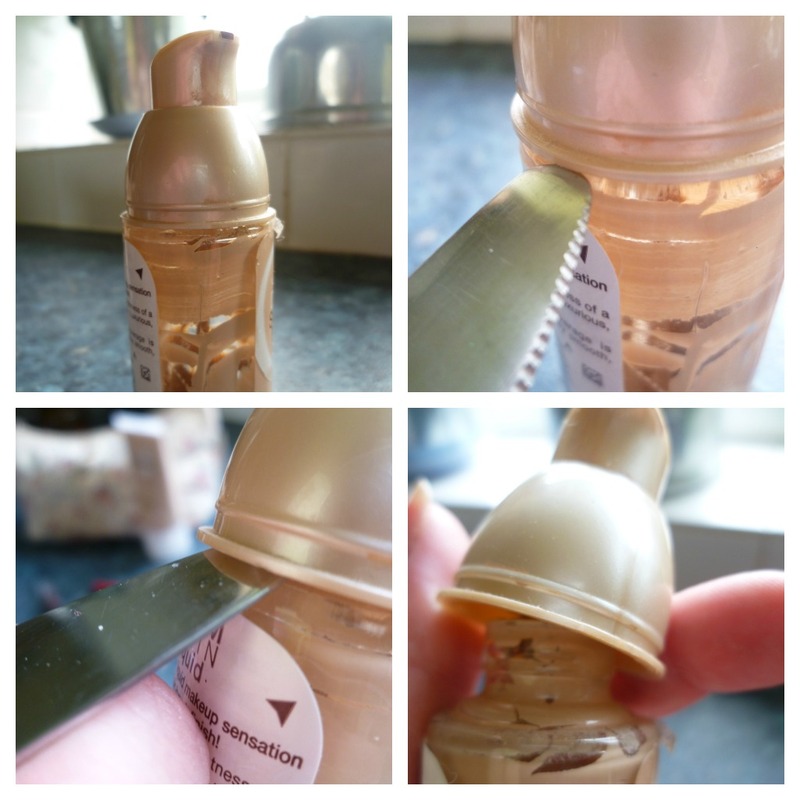 Then, pull the knife down slightly until the plastic starts to bulge. Keep going until - voila! It has been removed! 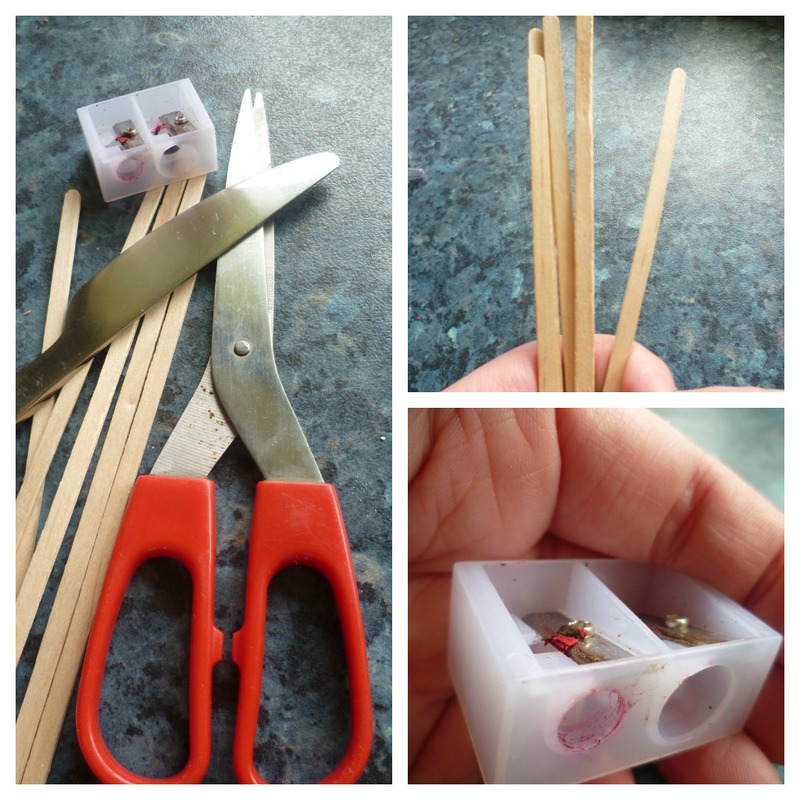 There should be at least one applications worth on the straw, and using your handy wooden stick, you can get to all the rest of it. Wipe off stick after use and put the pump back on. I don't push it all the way back on, I just rest it on top. Next up, a cheaper foundation that comes in a squeezy tube affair. Once it has splurged it's last, simply snip off the top and behold the inside. I use a clip peg to insure that it does not dry out between applications. This particular brand might only be £1.99 - but I want all of it. 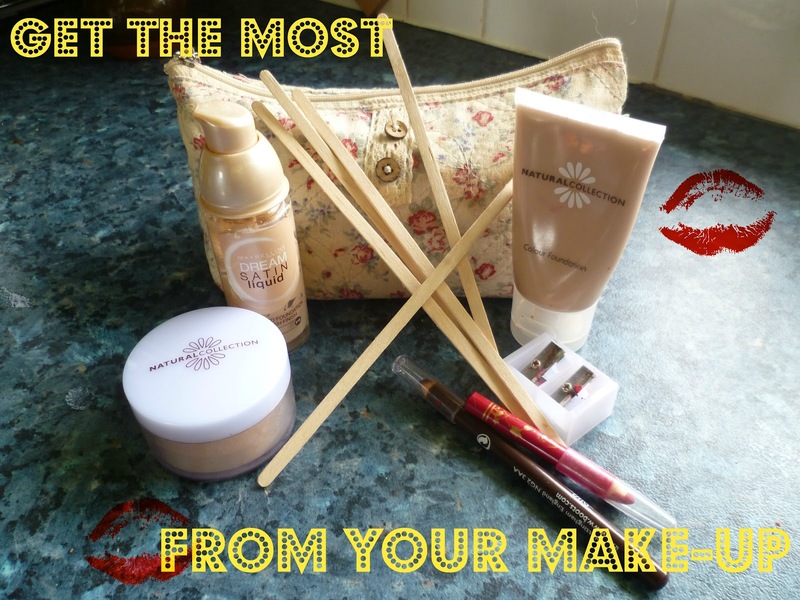 Powders: These come in various containers, but the brands I use with my kabuki brush come in this type. There comes a point when, no matte how hard I shake, no more powder will come forth. Enter the knife, the wiggle and the voilà. I usually recycle the perforated bit and just keep the lid. 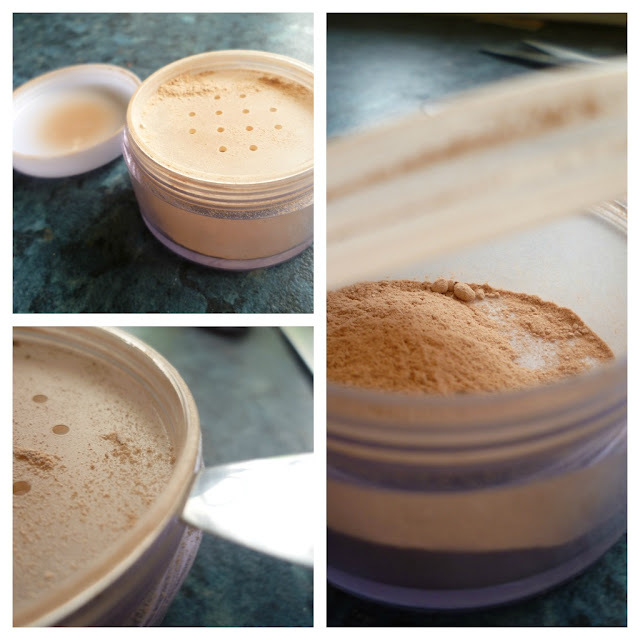 I have made a powder last an extra 3 weeks using this method. Pencils: I have only been using lip and eyebrow pencils this year, after much time spent in the company of the plastic screw up crayon types. And I am mighty pleased I made the switch. I get SO much more use out of them. 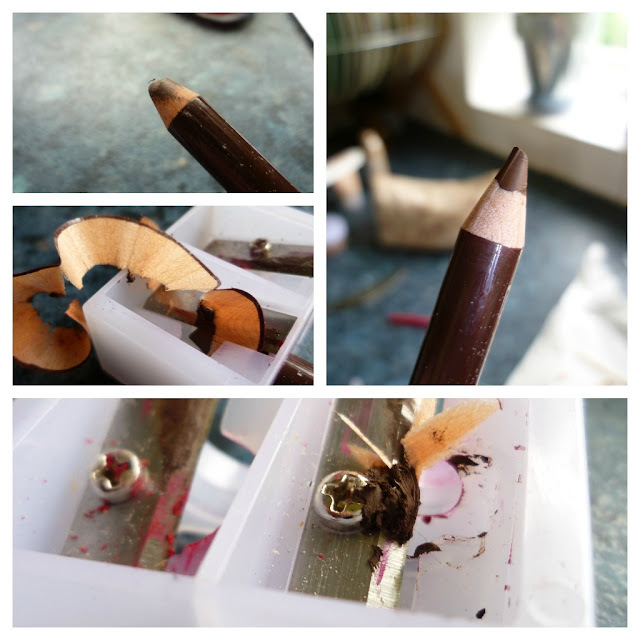 A decent make-up pencil sharpener is worth it's weight in gold* My advice is to not scrimp, and do not, like I did, buy an 11p sharpener off the market. It shall leave you with untold frustration. These are pretty straight forward, but do clean between use. I use the same side for brown and red. If I forget to clean, I can end up with red streaks in my brows or a nice brown outline on my lips. What are your make-the-most of tips? * I vividly recall my Ma going doolally at me as a child for shoving one of my crayons into her's and trashing it. I think she may have wept. Or maybe that was me after the shouting at I received. Use a stippling brush to apply foundation. You use way less than using a regular foundation brush, sponge, or fingers and it gives a nice airbrushed appearance. I also fix broken eyeshadows or blushes with alcohol and a penny. Break up the shadow then add a few drops of alcohol. After it is damp use a cloth covered coin to press it down. Works every time. This is incredibly handy! Next time I treat myself to a posh coffee I shall acquire some of those sticks so that I don't miss out on any make up!! It makes me wild too. I was using a dual pump moisturiser affair for a while but gave up in disgust because it kept jamming and you were supposed to give it a sharp tap upside down to clear it. Ridiculous, it just meant cream squirted out and there was massive wastage and even then it didn't clear the problem permanently. I wonder if it was deliberate so that one had to buy more. I've never seen such a stupid bottle for anything! Waste drives me nuts, having been brought up by grandparents and a mother who had been through the war probably has something to do with it. Those pump bottles irk me but I generally like the foundations that come in those. Saying that I've recently moved over to a pan stuck so wastage should be a minimum with that. 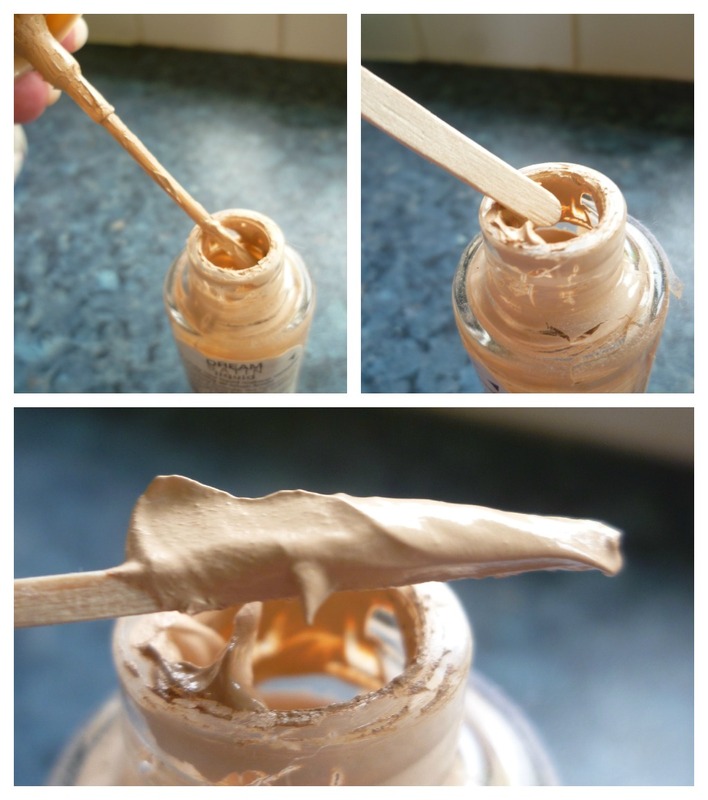 My tip is toix some face team in with your foundation to make a light tinted moisturiser. When you cut open tubes just pop the top over the cut area. Keeps it airtight and nothing floating around can drop into any open areas. Mind you there are time I'm just glad to get the last splurt out because I don't like the product and want to be done with it. Lotions and creams that I loathe have lately been left at work in the staff toilet and around the drug room sink. Nurses are tight and will use up any hand cream. The best gift we ever got from a patients was six bottles of good quality lotion! What a helpful, fantastic post. Thank you! 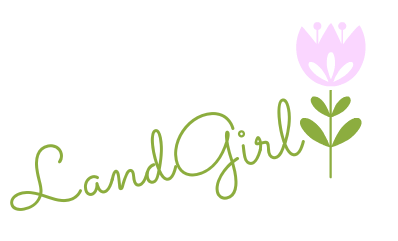 I like to squeeze, squish, and bump every last drop out of my cosmetics and beauty products, too, especially those that are hard (or impossible) to get locally. Yup, I always scrape out every last molecule from my foundation, probably about 3 years old by the time I finish them! I never knew that about fixing eyeshadows though, will have to try it. If you put your eye/lip pencils in the fridge for a bit first they will sharpen better too. What a fantastic post! I hate that I'm not getting the very last from my products, great ideas. I'm with Vix I add nail varnish remover to gunky nail varnish, works wonders. Using a lip brush to apply lipstick makes it go further. Store facial wipes upside down to stop them drying out. I'd suggest buying a nail varnish thinning product to get the most out of your polishes when they start to dry up and go gloopy.